It is pleasant and comfortable in a good bath, you don't even want to get out of warm water. However, besides convenience, many people pay attention to the beautiful design. 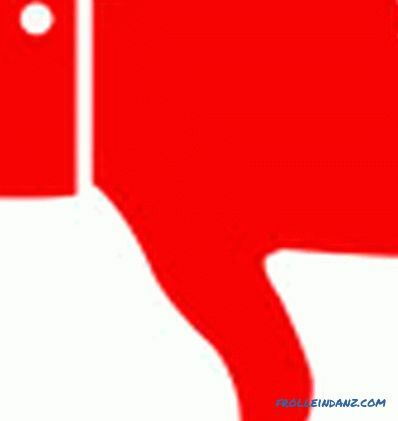 After all, today there are plenty to choose from - not like before, when only standard cast iron products were available. But sometimes it is difficult to understand which bath is better - cast-iron or acrylic or steel bath. These three materials are the most popular, and today we will compare them and determine the leaders. Strong and reliable, well-preserving heat products made of cast iron (representing an alloy of iron with carbon) appeared the very first. And it happened in 1925, in Spain, near Barcelona. The Roca brothers decided to expand the range of their factory producing cast-iron radiators, starting production of cast-iron baths. To this day, ROCA is one of the recognized world leaders in this direction. The products of this brand are of high quality, durability and variety of colors. In Europe, there is a noticeable decrease in the total number of cast iron products, they are gradually being replaced by steel baths, which are easier to transport, cheaper and more environmentally friendly to manufacture. Cast iron baths are produced by only a few companies. The most famous are Jacob Delafon, PORCHER, and also ROCA. In Russia and other CIS countries, they are still produced in large quantities, but only in a couple of standard sizes, as well as with a small choice of shades. We note that European cast iron products have a more beautiful and diverse design. For example, there may be handles on the side or armrests, the bottom is increased by changing the angle of inclination of one of the backs. Sometimes one back for convenience clean at all. And the design of imported products can be any: from the classics with the possibility of embedding to the luxurious English style. A properly made bath of cast iron must have walls of at least 0.5 centimeters and strong enamel, applied in the factory in two steps. Cast iron alloy contains in its composition a certain amount of manganese, silicon or sulfur, which gives it additional strength. The enamel coating can last from 10 to 30 years, possibly longer (depending on the load). Lack of diversity in configurations. They can be made only rectangular or oval. By value, the steel bath is more attractive than the cast-iron one. And the price may vary by two or three times. This is sometimes a powerful argument when deciding which bath is better - cast iron or steel. In addition, many consumers like the fact that products made of steel can take on virtually any shape. 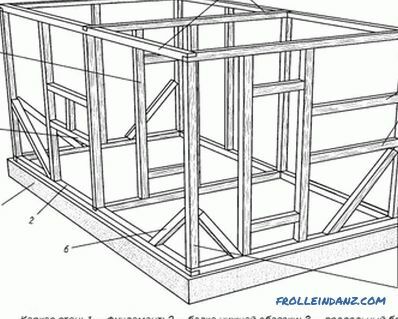 In addition to traditional rectangular and oval (like in cast iron), these are very convenient and compact angular structures, as well as polygonal, round, asymmetrical. Similar products are made of steel sheets with a thickness of 0.23 centimeters (thin-walled baths) to 0.35 centimeters (standard baths). The enamel on the basis of acrylic, covering the surface of steel, less thick than that of cast iron. But modern technologies of its application allow you to create a fairly reliable and durable coating. Among the foreign companies that produce high-quality steel products, we can mention the Finnish company Ido, the French - Porcher and Jacob Delafon, the German - Bamberger and Kaldewei, the Italian - Ariston, the Spanish - ROCA. They weigh from 25 to 30 kilograms, elegant in design and have a good enamel coating. Especially a lot of innovative technology uses the company Bamberger. For example, anti-slip coating, anti-slip, enamel plus, dirt repellent. The warranty on the bath - 30 years. Able to sag under the body of a heavy person. This material began to be used for the production of baths later on. Its full name is methyl acrylate. It is a synthetic polymer and is made from acrylic acid. It turns out a substance resistant to abrasion, ultraviolet and oxygen.Its surface is pleasant, smooth and warm to the touch. Take an acrylic sheet of a suitable size, and then bend it in the vacuum chamber as needed . The resulting container is not too strong: its walls bend easily, and when pouring water they may swell. 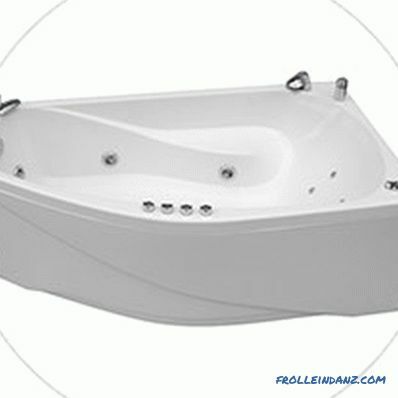 Therefore, you need to strengthen the bath: its surface is coated with epoxy resin in several layers, laying with fiberglass. The more layers, the bath is stronger. Injection molding technology involves the use of a fiberglass frame, on which acrylic is applied. 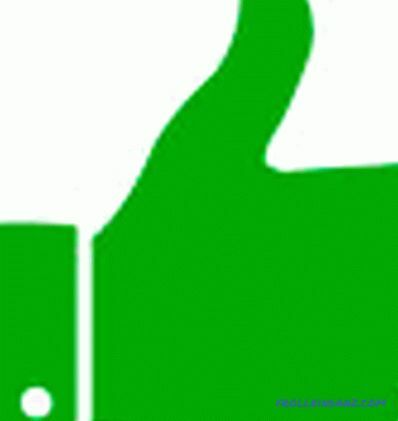 As a result, a more durable product is immediately obtained than the method described above. 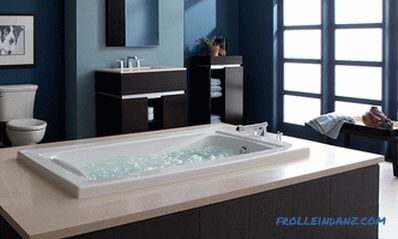 In any case, the “right” acrylic bath should have a wall thickness of at least 4-6 millimeters. When tapping on its sides, it should not be heard too sonorous sound. This may mean that the manufacturer cheated by deciding to save on the reinforcement process. Next, we mention manufacturers who produce high-quality acrylic products. This is the Czech company Ravak, Polish - Cersanit and Kolo, Spanish - Pool Spa, the Dutch - Riho, German - Duravit, Russian - Aquanet. When, before setting up a bathroom, the landlord decides which bath is better - acrylic or cast-iron, often outweighs acrylic. Because of its lightness, beautiful and varied shape. The device of an acrylic bath and its frame. Huge selection of shapes and sizes. Short service life compared to cast-iron and steel models. It is not so easy to bring a heavy cast-iron bath into the house - it is not possible for one person to cope with this. This is the reason for the difficulty in installing such products. Also, they must be firmly fixed on a flat plane. They are usually placed on four cast legs. To install an acrylic bath, you will need to assemble a metal frame and only after installing the bath on the frame it can be connected to the sewage system. This somewhat complicates the process of its installation, but since all the details are light, one person can handle this. Steel baths are also fixed on the legs, but one person can cope with their installation. In order to significantly increase noise insulation, it is often the case that a layer of foam is applied to the surface of the product or the bottom is glued with Penofol. 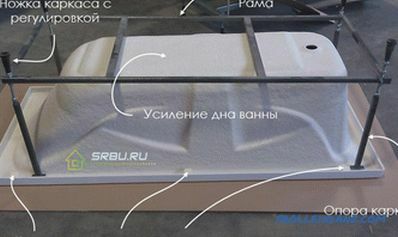 In general, the installation of a steel bath is the most simple. Noise insulation of a steel bath: on the left Penofol, on the right with foam. Results. The most simple to install can be called steel baths (albeit, in the case of applying foam, the process is somewhat more complicated). The second place belongs to acrylic baths, where you have to tinker with the manufacture of the frame. 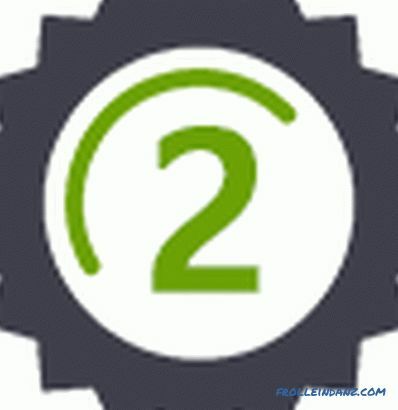 And cast iron products, heavy and bulky, close the rating. If the enamel on the cast iron is applied qualitatively and has a sufficiently thick layer, then the coating is very durable. And even if the stain has penetrated deep into the enamel, then it can be removed in almost any way, including chemical reagents and mechanical action. And the hostesses do it with great success. Steel products are coated with thinner enamel, which, respectively, must be cleaned more carefully than in the previous case. Especially when using abrasives. Otherwise, you can damage the surface, which will then be problematic to restore. Acrylic bathtubs are cleaned carefully, using soft care products and not using strong abrasives and aggressive “chemistry”. This will prevent the formation of cracks and premature failure of the product. Results. At this point, the most unpretentious, we have found products made of cast iron, and acrylic modestly moved to the very last place, the third. Steel baths took a middle position. However, the above-mentioned models of steel, covered with the innovative composition of "Enamel Plus", may also claim to be the leader in the simplicity of care. Products made of cast iron are not in vain still popular - they are meant to please their masters for at least 50 years, and this is a very decent time.Steel baths can safely serve for 20-30 years. Products from cast acrylic can withstand at least 15 years. But provided that their walls are at least 4 to 5 millimeters thick. Results. Cast iron is firmly established on the leading position - its longevity is beyond doubt (but the technology must be respected in the manufacture of this material). 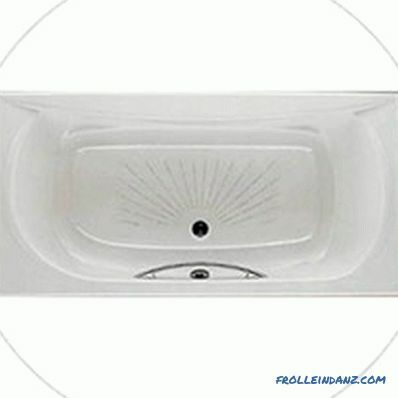 Steel baths are again in the middle of the rating, and acrylic products are at the closing position. 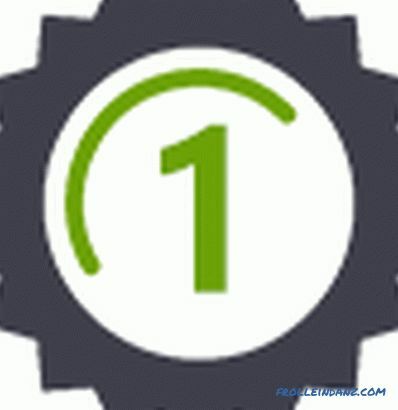 This item is closely related to the care of products, so we will repeat a little. As already mentioned, enamel, which is coated with cast iron, has a smooth surface, resistance to various reagents and mechanical stress. In the manufacture of high-quality cast-iron baths, specialists carefully check the quality of enamel at each stage, applying it with a layer of 0.8 to 1.2 millimeters. Firing occurs at a temperature of 110 degrees. So the protection of such a bath - "one hundred percent." 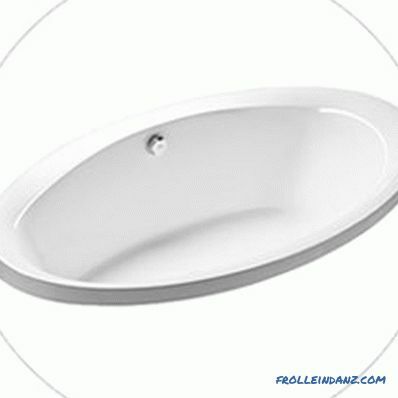 Enamel on steel baths is also distinguished by good quality, but due to its thinner layer, the protective coating is somewhat less reliable than in cast iron products. Acrylic is fragile enough, it does not like when something heavy is thrown at it. Because of this, quite cracks may appear. Which, of course, quite amenable to restoration, but all this adds hassle. 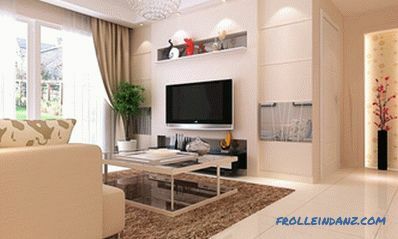 In addition, on the surface of acrylic very easily stains from various stains and scratches. Of all the coatings to acrylic should be treated most gently. Results. And again the gold-medal team receives cast iron baths, second place, according to tradition, took the steel, the third goes to acrylic products. Let's start with cast iron. There are few options here, just two. Want - choose a rectangular bath; if you want - purchase a more modern oval. 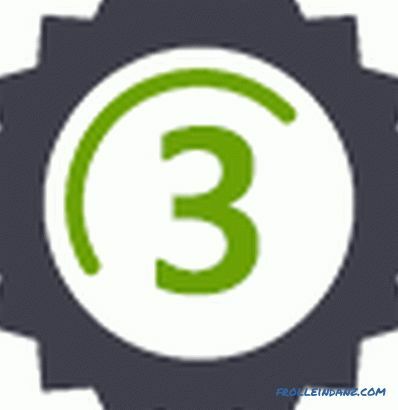 Third, as they say, is not given. After all, cast iron, though a very strong material, is still fragile. Therefore, he, unlike forging steel, does not allow to build complex shapes. That is why for those who dream of a more original design, the answer to the question is clear: whether to choose a bath - acrylic, steel or cast-iron. Naturally, in this case, the latter option immediately disappears. But acrylic and steel on this parameter are in step. Both materials allow you to recreate any shape that pleases the soul. 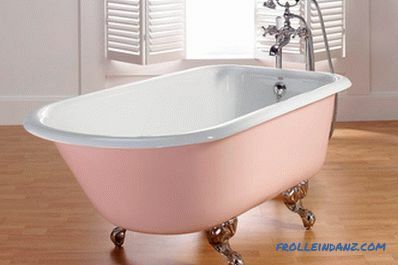 Want - the bath will be perfectly round; if you want, it will be whimsically curved or made in the form of a polygon. A very practical form for small rooms is triangular. It allows you to easily fit the bath in the corner, without taking up much space. Results. According to the study, there are two winners at once. The laurels of superiority divided steel and acrylic products among themselves, and the iron quietly faded into the background. 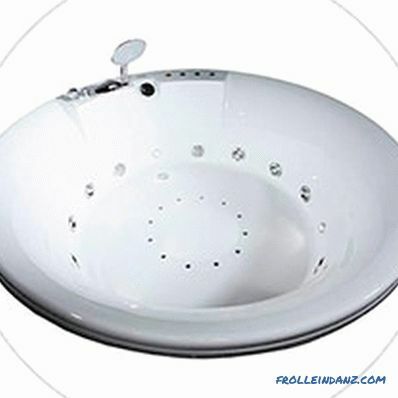 European-made cast-iron baths can be from 150 to 180 centimeters long and 60 to 90 centimeters wide. The standard length of the lower (inner) part is 110-120 centimeters. Modern technologies (changing the angle of the back, for example) can increase this size to 130-140 centimeters. Domestic baths of cast iron make a width of 70 centimeters and a length ranging from 120 to 150 centimeters. The variety of shapes for steel and acrylic products also implies a variety of sizes. For example, we give baths made of steel produced by the German company Kaldewei. The large model of this brand, the Corpostar, has dimensions of 190 by 90 centimeters, and the small Miniform model is 157 by 70 centimeters. The Japanese-style Kusatsu Pool model is distinguished by an increased depth (81 centimeters) and compactness (140 by 100 centimeters). Acrylic baths are just as diverse in size. They can be big and small, wide and narrow, deep and not very. Corner and round versions are available with different side sizes and diameters.If we talk about rectangular and oval models, the bowl they can have a width of from 70 to 170 centimeters, and length - from 120 to 190 centimeters. Results. More modern steel with acrylics again became leaders, leaving behind solid, but conservative cast iron. 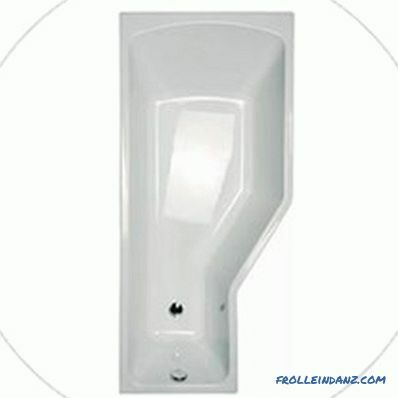 They give the opportunity to choose the product for any bathroom and for any purpose. For example, a large round bath may well be used immediately for two. A compact corner option - for a small apartment. There may be three options: installation along one of the walls (most common), corner placement and installation in the middle of the room. 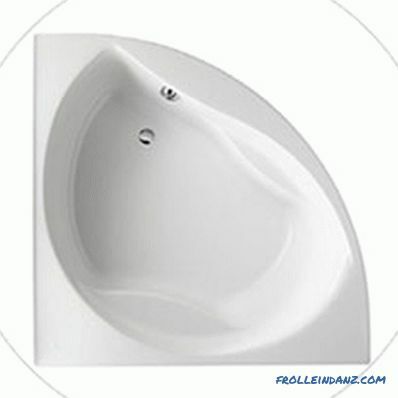 The latter option is used for large bathrooms when using large oval or round baths. 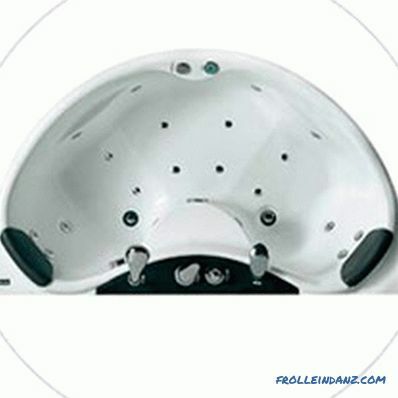 Which are often equipped with hydromassage and other pleasant additions. Corner models are made both symmetrical and with different sizes of sides adjacent to the walls. As a rule, the side opposite to the corner has a rounding. It is not only practical, but also looks beautiful. Cast iron baths, as a rule, are placed along the wall, less often they are placed in the center of the room. In the corner because of the design features can not be installed. As for steel and acrylic products, they can be mounted in any of the three options. To choose a suitable model is not a problem. Results. Again, we have two leaders - the possibilities of the type of installation are greater for steel and acrylic products. Cast iron baths remained in the shade. Here we consider the degree of comfort that products of various materials give us. Let's start with the temperature of the water - for a pleasant swim it is important that it does not cool down for a long time. Good old cast iron is very good in this sense - it keeps the water warm for a long time. However, modern acryl also boasts good heat saving. But the steel - alas - quickly cools the water. In addition, she has another drawback - strumming strongly when the bath is recruited. Cast iron and acrylic are very quiet. The walls of a bathtub made of cast iron will never bend. Now consider the following two products with this parameter, determining which bath is better - acrylic or steel bath. Steel may well hold its position, without hesitating under the weight of the body, which is not true of acrylic. The deflection of the walls is its main drawback; the metal frame is designed to cope with it, on which the bath is mounted. This is most relevant for people who are overweight. Results. According to the parameters considered the most convenient - cast iron products. Acrylics are not without flaws in this regard, so they can share second place. Steel baths are somewhat inferior in this regard, acrylic, but in some cases can act on an equal footing. 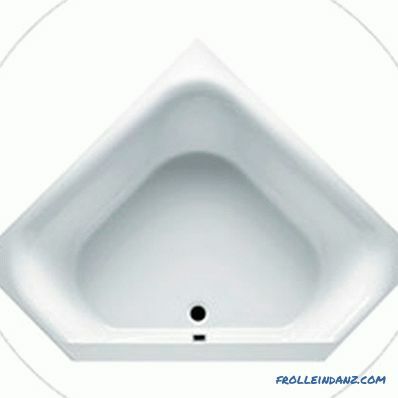 Also, baths made of steel and acrylic are often equipped with all sorts of comfortable seats, handles, armrests. The heaviest are baths made of cast iron. They weigh at least 120-130 kilograms. Such a solid weight (sometimes reaching up to 150 kilograms) provides good stability, but considerably complicates installation work. Which will cost more than installing steel or acrylic baths. A European-made steel bath with walls from 2.5 to 3 millimeters is much lighter than cast iron, and several times. Her weight - from 25 to 30 kilograms approximately. The most "weightless" material can be called acrylic. If a bath made of it has a length of 150 centimeters, then its weight ranges from 15 to 20 kilograms. Products with a length of 170 centimeters weigh from 20 to 25 kilograms. By the way, when buying, pay attention to this: too light bath, very different in weight from these indicators, may turn out to be of poor quality. 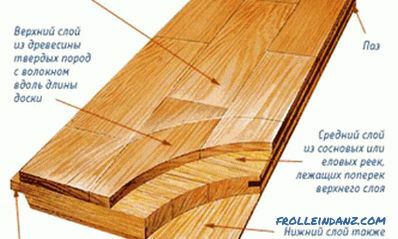 Otherwise, the manufacturer shipped, having made a product with a smaller than it should, number of reinforcing layers. Results. In the first place we define products from acrylic. On the second - steel baths, and on the third - cast iron, completely unaffordable. Again, let's start with the cast-iron appliances. Domestic models without special "frills" and jewelry will cost 50-70 dollars. European baths will cost more: from $ 200 and up.The price for premium collections of PORCHER and Jacob Delafon companies can reach up to 450-700 dollars. Baths made of steel cost twice (or three times) cheaper than cast iron. If we talk about European products, then its price will start at $ 100. 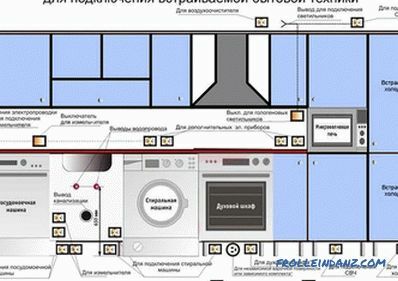 Products of Russian manufacturers will cost from $ 50. Acrylic devices have a very wide range of prices. 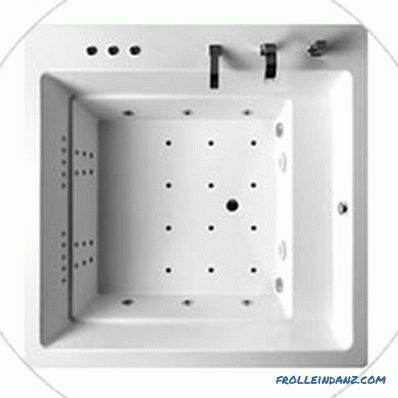 Moreover, they are often equipped with a whirlpool system, which should also be taken into account when comparing the cost of different types of baths. The most budget option will cost from $ 60 (made in China). Russian products will cost from $ 100, European - 130-200 dollars. Results. The first place in cheapness belongs to the right steel baths. In second place - acrylic products. Cast iron completes the rating.